(Phys.org)—A trio of researchers affiliated with several institutions in Germany, Uganda, the U.K. and Switzerland has found via experimentation that wild chimps are aware of what other chimps know and behave accordingly. 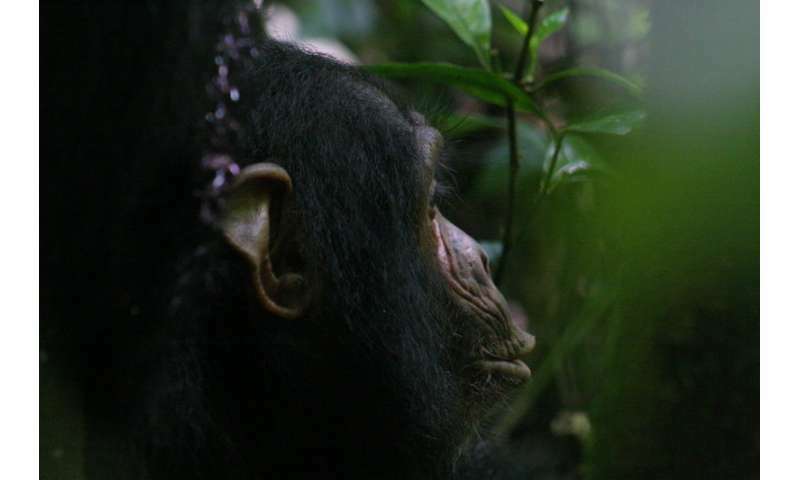 In their paper published on the open access site Science Advances, the group describes experiments they carried out with fake snakes and wild chimps and what they learned by doing so. Many animals sound out warnings when encountering something dangerous—birds chirp or screech, dogs bark, and chimpanzees call out sounds known as "hoos." Up until now, the consensus in the biological fields has been that humans are the only ones who modify warning messages based on what they believe other humans in the vicinity already know about the danger. If someone comes home and finds a burglary already in progress, they are likely to react differently if there is someone already there at home to warn them. A dog, on the other hand, will likely bark in the same way no matter what. But the researchers wondered about chimpanzees. 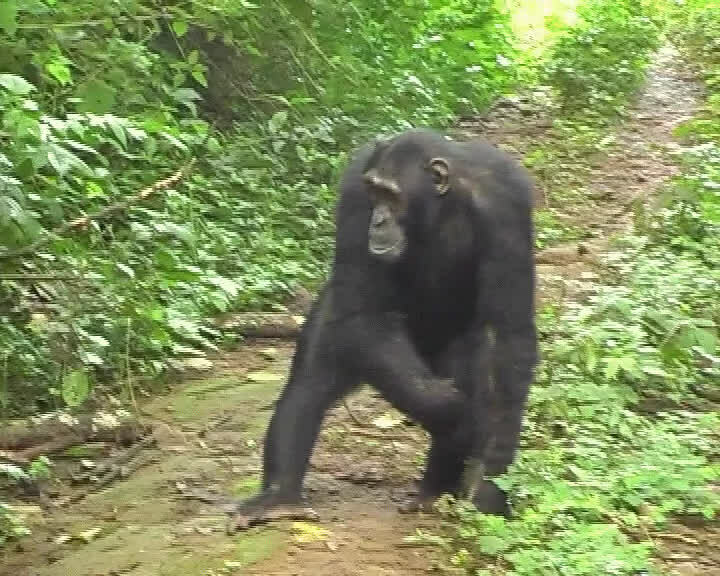 They created fake snakes and placed them on paths frequented by chimps in the wild in Uganda and recorded how they reacted. In the second series of experiments, the researchers played audio recordings that the chimps could hear just prior to them stumbling upon the fake snake—some of the recordings were of chimps making alarm calls while others were of chimps making normal at-rest hoos. 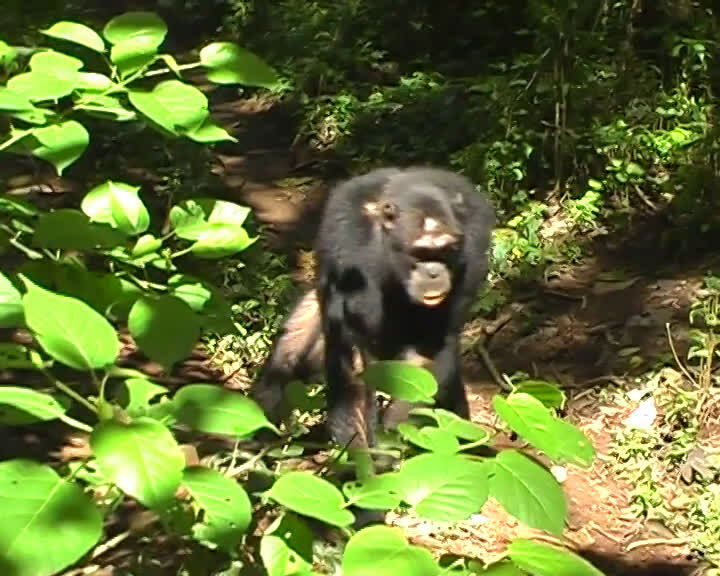 In watching the chimps react on video, the researchers found that they would hoo much less actively after just hearing a warning hoo on tape versus an at-rest hoo. They were clearly associating the warning hoos on tape with another chimp having already seen the snake. Because of that, the chimps modified their reactions, hooing much less sharply. In so doing, they were demonstrating an awareness of what their fellow chimps already knew, something that until now has only been observed in humans. Adjusting communication to take into account information available to one's audience is routine in humans but is assumed absent in other animals, representing a recent development on the lineage leading to humans. This assumption may be premature. Recent studies show changes in primate alarm signaling to threats according to the receivers' risk. However, a classic problem in these and other perspective-taking studies is discerning whether signalers understand the receivers' mental states or simply are responding to their behavior. We designed experiments to exclude concurrent reading of the receivers' behavior by simulating receivers using prerecorded calls of other group members. Specifically, we tested whether wild chimpanzees emitted differing signals in response to a snake model when simulated receivers previously emitted either snake-related calls (indicating knowledge) or acoustically similar non–snake-related calls (indicating ignorance). Signalers showed more vocal and nonvocal signaling and receiver-directed monitoring when simulated receivers had emitted non–snake-related calls. Results were not explained by signaler arousal nor by receiver identity. We conclude that chimpanzees are aware enough of another's perspective to target information toward ignorant group members, suggesting that the integration of signaling and social cognition systems was already emerging in early hominoid lineages before the advent of more language-specific features, such as syntax.